We have just returned from holiday and the kids had to spend many hours in the car. So how to keep them busy? I quickly packed a couple of paper pads and colouring books hoping it would distract them for more than 5 min. Well, you might be surprised to discover that they spent many hours concentrating over their drawings. 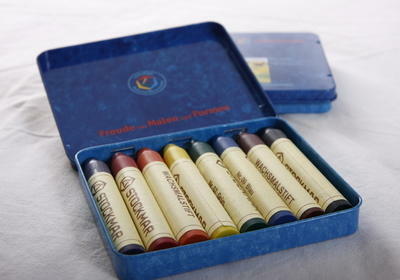 I realised I had made the right choice when I bought a box of Stockmar Crayons. The colours are really bright and they stick to the paper. I don't think the children would have been happy (and us neither once they would have been bored and whinging) with a cheap box of crayons where you can hardly see the colours. Even with a pad balancing on their knee, they made some great work of art. The box was also very handy to put them away without them rolling around the car. So yes at £9, they are not the cheapest box of crayons but they do last and the beeswax used does not contain any nasties. As they come with a nice handmade handbook, this makes a very nice present for toddlers and older children and will definitely become the favourite set of your children.